North Hudson Regional Fire and Rescue made history recently by swearing-in 37 new firefighters, its largest hiring class ever, including Lisa Napier, the first female firefighter in the 20-year history of NHRFR. All 37 new firefighters are U.S. military veterans, showing the regional fire department’s unwavering commitment to supporting our nation’s veterans. 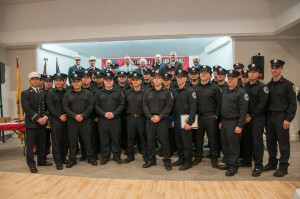 The new NHRFR firefighters are: Alexis Barreto, Ryan M. Haas, Kevin L. Riker, Joshua M. Grochowski, Stephen Arxer, Michael A. Viggiano, Mitchell L. Hoffman, Philip T. Hoffman Jr., Paul B. Brown, Rembert A. Amistad, Patrick J. Klebaur, Shane M. Paczkowski, Julio C. Pinedo, Kenneth E. Stewart, Lisa A. Napier, Kevin P. Greenfield, Alex C. Burkhardt, Richard J. Villane, Ryan A. Malanot, Matthew M. Buchman, Ronnie J. Guerra, Jose J. Solano, Patrick L. Morris, Jeffrey T. Mullins, Arthur J. Knutsen, David L. Washington, Fernando Rodriguez, Mark S. Moran, Andres F. Lopez, Marc R. Vero, Michael A. Carvajal, Thomas H. Ruane, David C. Sigwart, Mauricio B. Rojas, Kyle L. Rowand, Johandy Martinez and Xavier A. Romo. 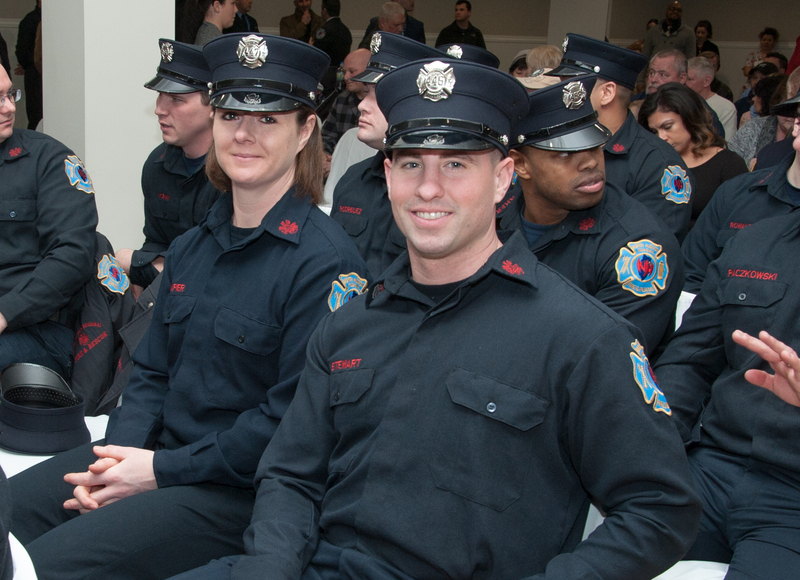 Three firefighters were promoted to the rank of Captain: Joseph B. Gobin, Peter Mancini and Timothy P. Richards. Nicholas A. Prato was promoted to the rank of Battalion Chief. Present at the ceremony were Chief Montagne, Mayor Turner, NHRFR Executive Directors Michael DeOrio and Jeffrey Welz, Deputy Chief Anthony Venezia, Battalion Chief Alider Pratts, and NHRFR Board Members Guttenberg Councilman John Habermann, Christopher Pianese and Martin Martinetti. NHRFR is a nationally recognized fire protection unit, and one of the largest regionalized fire departments in the United States. Covering the North Hudson towns of Guttenberg, North Bergen, Union City, Weehawken and West New York, NHRFR takes pride in maintaining one of the best response times in the nation.